The main attraction of the town is the Castle Bath established in the 8,5 ha primeval park - a nature conservation area - of the former Almásy mansion. 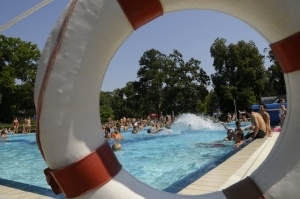 In 1985 it was classified as a medicinal bath and with its 19 pools it was awarded the classification of a four-star - the highest category - open-air and medicinal bath by the Hungarian Association of Baths. It has been developed continuously and it offers new, indoor pleasure pools, new medical treatments, a children´s water paradise, a wellness centre, a bubble bath, a wave bath to visitors. In the neighbouring Ladics house you can see an exhibition presenting the lifestyle of the high society living in the 19th and 20th centuries. 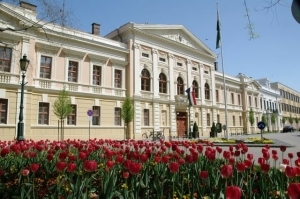 Other sights of the town include the Greek Orthodox church with a unique, beautiful iconostas in the county, an exhibition based on the inheritage of painter György Kohán, a winner of Kossuth prize, as well as the beautiful churches and monuments of the town. In the bath city hotels, pensions, camping sites and private accommodation await visitors. The hotels are excellent for the participants of conferences and programmes. The "Ask me" Information and Help Animator service aims to improve the tourism services of the town. 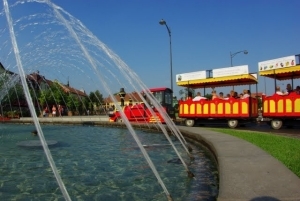 Its young workers give information and recommend programmes for active relaxation to the visitors and their children by providing a mobile playhouse and a tourist bus. Apart from bathing, excursions and entertainment, the town also offers gastronomic specialities. 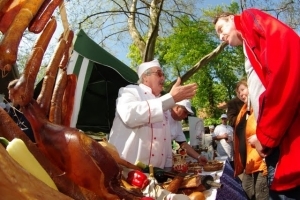 Visitors can taste and buy not only the world-famous sausages of Gyula, but other prize-winning products of the Meat processing factory of Gyula.